Hi Casey, I'm not referring to the ESMA-related margin increases. This is actually funding costs I'm talking about. From 4 February, we’re changing the way we calculate overnight funding on shares and indices. Whereas the interest rate used to be based on the currency of the trade, it will now be based on the currency of the underlying instrument. This could affect you positively or negatively – see below for reference. If you trade on Wall Street in GBP, you’d previously pay overnight funding based on the GBP interest rate. From 4 February, you’ll pay funding based on the USD rate instead. 1 ‘Rate’ refers to the 1-month interbank funding rate (eg LIBOR for the UK). Rates correct as of 14 January 2019. 2 ‘IG rate’ refers our total funding charge, which is 2.5% on top of the interbank rate. We debit your account for a long position, and credit your account for a short position (if the interbank funding rate is greater than 2.5%, or greater than 3% on mini/micro CFD contracts). Find out more here. right @Justinian, i only rarely hold positions overnight so doesn't really affect me. 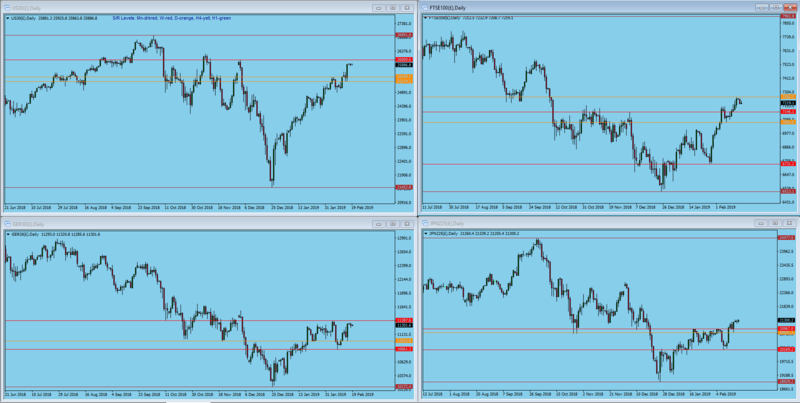 4 Hour charts and looking for Dow continuation of the uptrend with a test of the H4 resistance 25156 and then on to the daily chart resistance 25439. Ftse in a similar situation, UK GDP and manu prod data at 9:30. Dax and Nikkei with similar looking charts, Dax suffering a stream of poor data releases last week while Nikkei pulled into the Asian slump. Japan public holiday today. 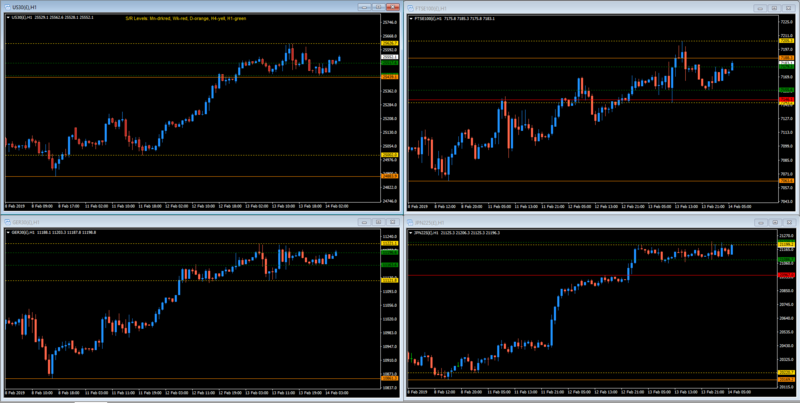 Not much on the Euro calendar this week, if Dow can make progress will be looking for Dax to follow. 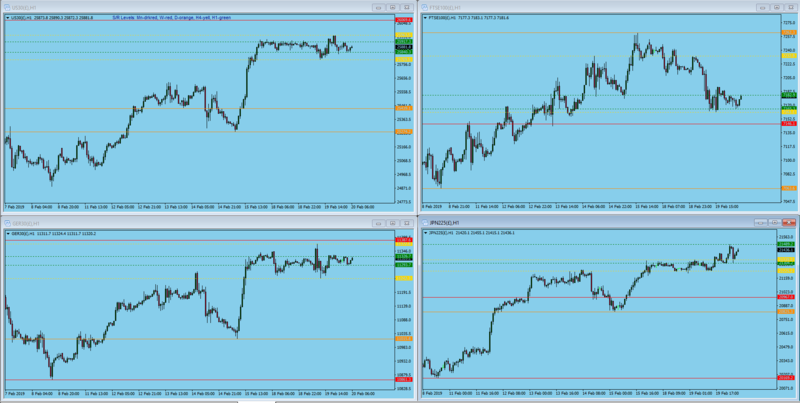 Dow stalled yesterday after initially pushing up though 25156 from yesterday's post. 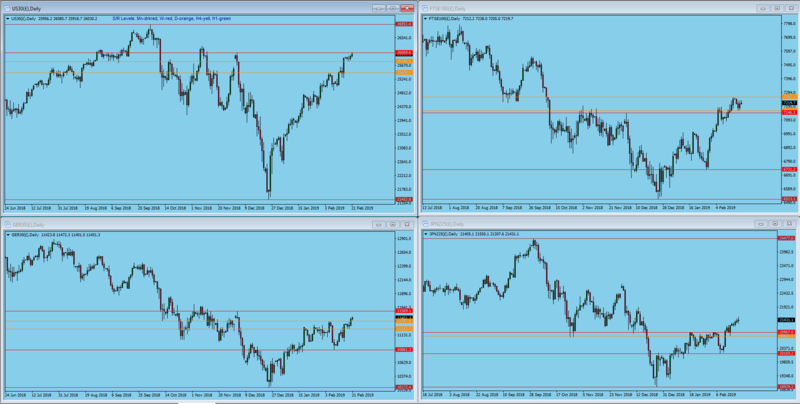 Nikkei had a strong push up overnight and Dax has worked it's way into clear space while Ftse has moved up to resistance. Today will be looking again for Dow to push up through H4 resistance currently at 25244 and for Dax and Ftse to follow. As ever though, a failure at resistance usually initiates a test of support. IG 'Trade of the Week' Dow moves up through the daily chart resistance level 25439 mentioned in Monday's post, may see a retest of that today. 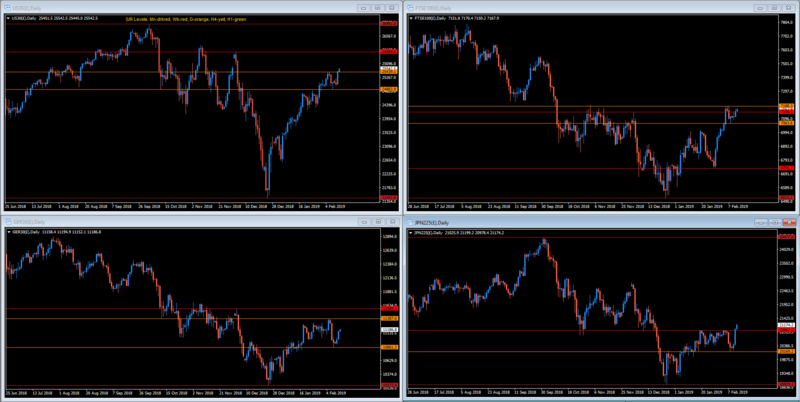 The others following on with Ftse back up through the weekly resistance level for a second attempt on 7188. Dax making hard work of it and still has a lot of ground to make up to reach resistance at 11387. 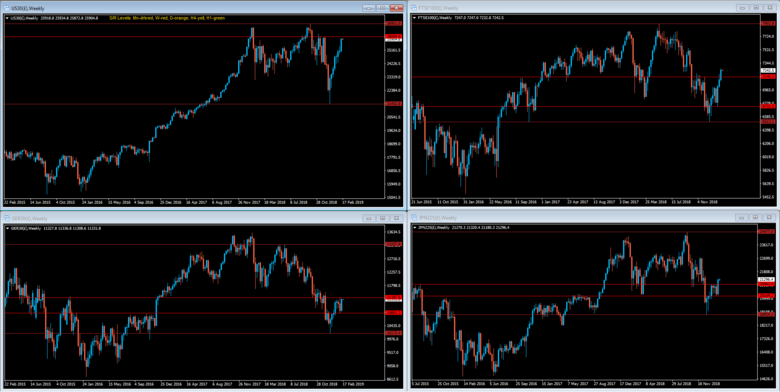 Nikkei finally breaks up through 20967. Dow after a second retest of support at 25439 now looking for resistance, the most recent level to test is at 25626. The other indices look poised to follow. Dax caught out this morning. 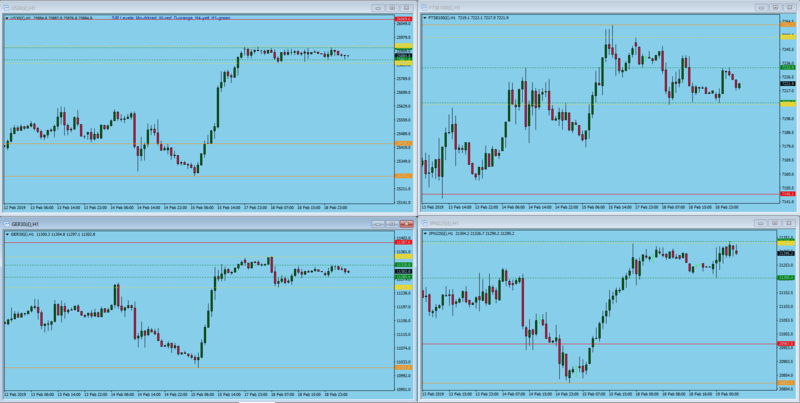 Slightly better than expected German GDP figures on the Euro open sent Dax racing higher but Dow found sellers at the H4 resistance level and reversed hauling Dax down with it. Dow currently retesting the recent low after the disappointing retail sales yesterday so waiting for either a break below or a reversal to retest the recent high. Not much on the calendar today. On the weekly charts Dow and Dax have raced up to their respective weekly resistance levels while Ftse and Nikkei have broken through theirs. US public holiday today, and no major calendar events so could be a bit directionless and consolidative today but would like to see Dow take on 26000 then 26069 and Dax attack 11387. 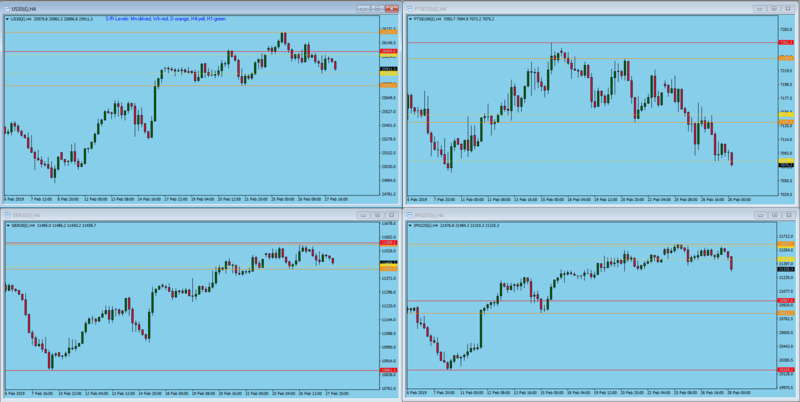 Minimal movement yesterday so again looking for Dow and Dax to shuffle up and take a closer look at their respective weekly resistance levels (red). 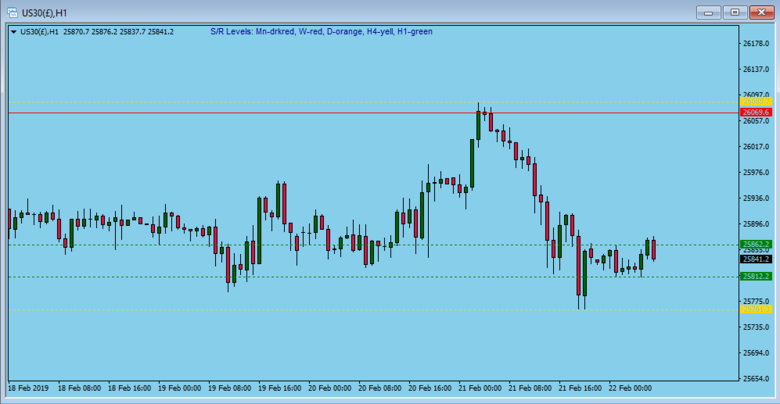 Ftse having had 3 x hourly bar retests of recent support (7207) should be looking to test Friday's resistance at 7262. Forgot to mention German and Euro economic sentiment and expectations data out today at 10:00. 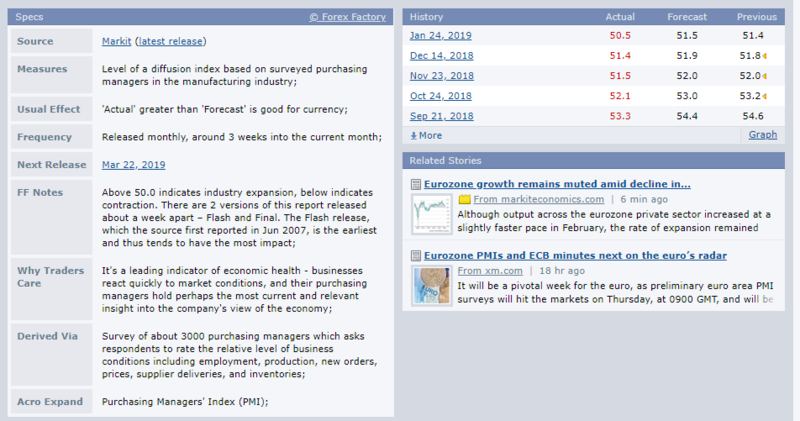 Also, Thursday sees German and Euro PMIs which are all hovering around 50 (above 50 = growth, below 50 = contraction). 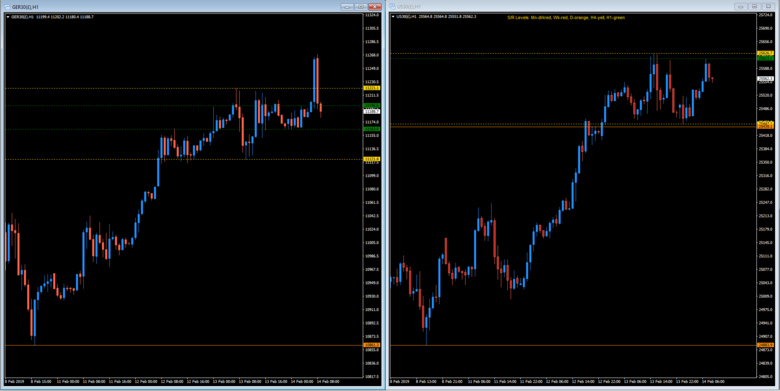 These two related data sets could well influence the direction of the Dax for the month ahead. Interesting yesterday on London open, Dow didn't react so Dax and Ftse did their own thing which was to head off in opposite directions. 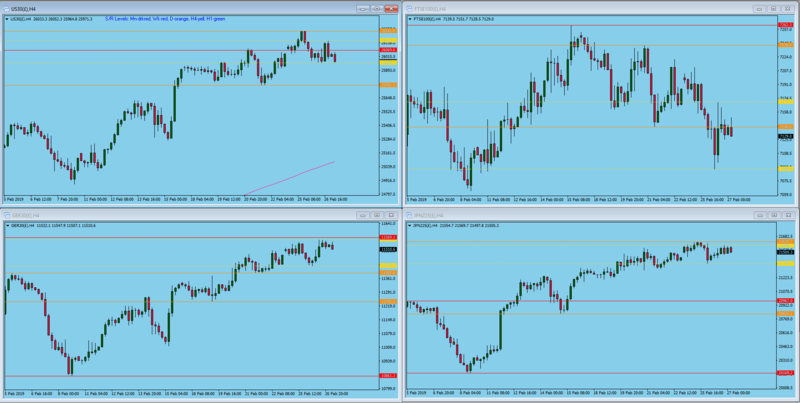 Dax made a grab for the weekly resistance level, missed and fell back while Ftse found stronger support down around 7161. Dow maintains a bull flag and may be waiting for the last FOMC meeting minutes release today at 7:00 pm. See brief below. Bank of America Merrill Lynch Research discusses its expectations for tomorrow's FOMC minutes from the January meeting. "The minutes of the January FOMC meeting will be of particular interest given the extreme dovish pivot from the Fed. We will be looking to learn about the following: 1) why did the Fed go from signaling additional hikes in December to no further hikes just six weeks later in the January meeting? 2) What is the Fed watching to determine next steps? Is it global data? Financial markets? 3) How has the Fed's thought process evolved around the balance sheet normalizationprocess?," BofAML notes. 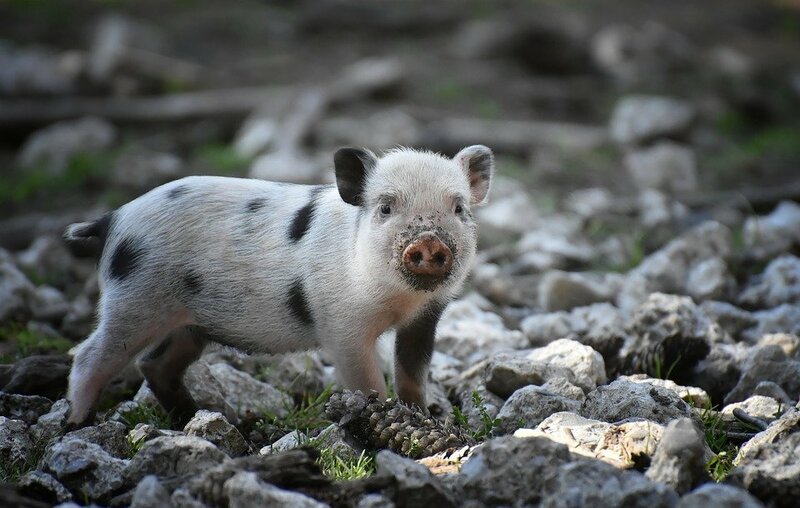 "On hikes, we think there will be a consensus that the best move is for the Fed to signal a pause...On risks, we expect a discussion about the global backdrop, with particular attention on the slowdown in China and the weakness in Europe....The balance sheet discussion may be the most notable. The Fed put out a statement with the last meeting which said that the Fed will embracean "abundant" reserve framework and will allow the balance sheet to adjust to economic conditions. However, we are still missing details. What is the timeline? Is there a target for the optimal level of reserves? Will the Fed taper? We think the Fed will drop some hints on these issues in the minutes as a way of testing the market reaction," BofAML adds. Two takes on impending doom, take your pick. Dow sidles up to the all important early December high before the big Dec drop, Dax poised to tackle resistance of it's own though keep an eye on the EU and Ger PMIs 8:15 - 8:30. Ftse and Nikkei look well positioned to continue onward and upward. 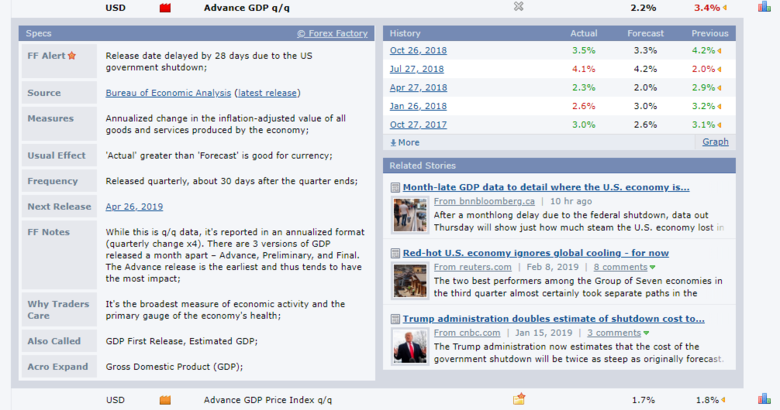 US Durable goods at 1:30. German manu PMI goes deeper into contraction while EU manu PMI also drops below 50. 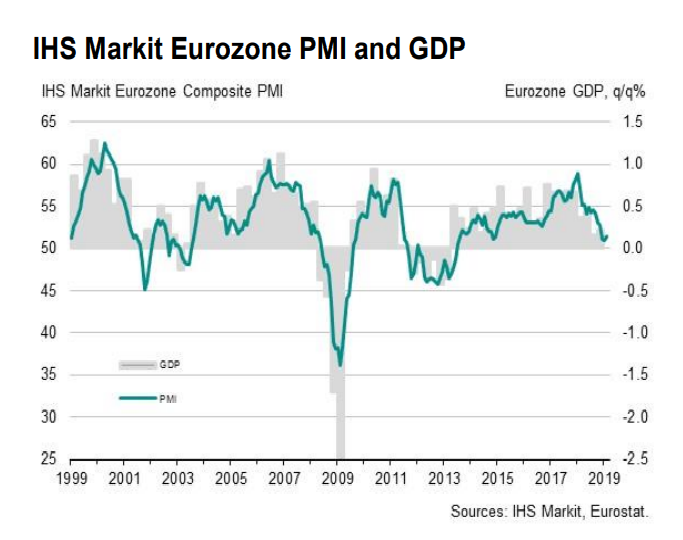 EU PMIs point to GDP growth of just 0.1%. "The NYSE Advance/Decline (AD) line made another new all-time high yesterday. 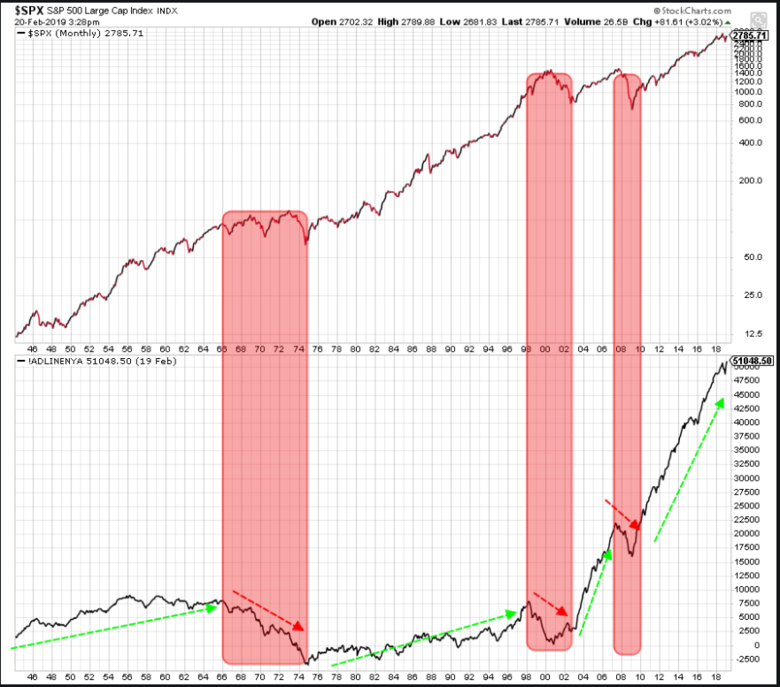 This is a very good sign, as market breadth tends to lead stock prices. Also, breadth breaks down ahead of major market peaks. Yet another clue that this bull still has some tricks up his sleeves..."
Dow tags the weekly resistance level 26069 then pulls back to settle on recent support 25761. US - China talks continuing giving drip feed news this week and into next, no major break either way as yet. Dax sitting on daily chart resistance turned support 11387, to the up side is the weekly resistance level 11569 while on the downside daily support level is 11242. Watch out for German GDP numbers 7:00 am today. Yesterday we saw lower PMI figures than expected pointing to lower GDP figures, GDP Q/Q forecast at 0.0% and Y/Y forecast at 0.9%. 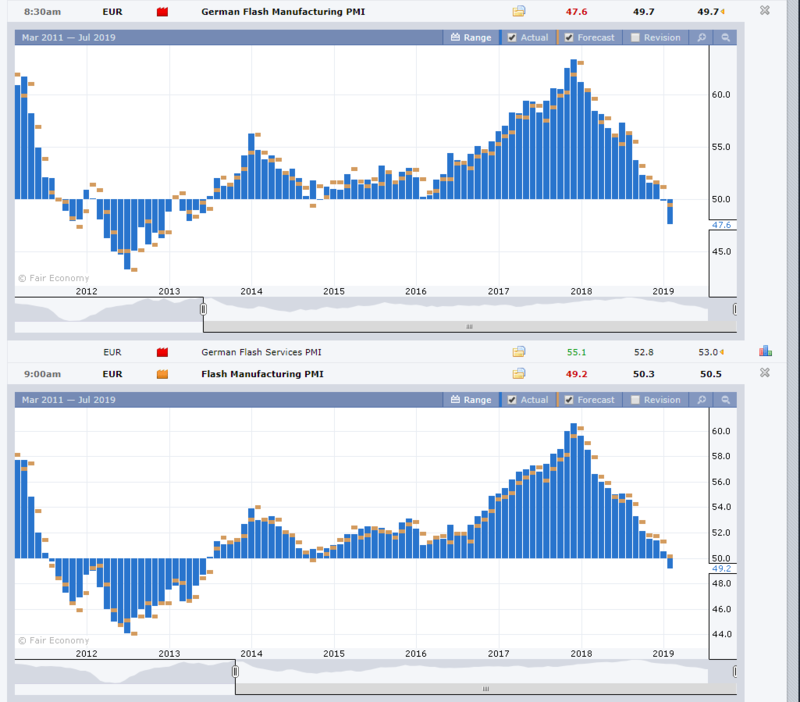 German IFO business climate data at 9:00 am and EU CPI data at 10:00 am. Indices daily charts, Dow H4. Nice example of why Support and Resistance is the King of indicators. Below is my Dow chart from December 4th where 26069.6 made it's first appearance as a struggling young H4 resistance level, over time he worked his way up through the ranks to become the Weekly resistance level. That hard work and diligence has paid off as yesterday he received the recognition so rightly deserved when he was tagged and saluted to the tick. Looking at this daily chart of the Dow (below) it is clearly a bull flag hard up against resistance while from the fundamental perspective trade negotiations continue in Washington. What the final result of those negotiations will be nobody knows, not even the participants, but whatever, no one could really say this is a bearish looking chart. There will always be those who are hostage to their own crippling bias who will forever be telling you this and that, they will stretch technicals to beyond breaking point to try to give their bias some validation. Why bother, they are always wrong far more than they are ever right. It is completely the wrong approach. Your bias is worth nothing, the market doesn't care about your opinions. Block out the noise and just read the chart and react. Most don't understand the difference between chart reading and technical analysis and think they are both the same thing, they are not. The chart has a rhythm and influences that are not bound by technicals which is why technicals fail so often. Whenever price runs into a boundary it will either break through or reverse depending on influences you can neither see nor know, boundaries are great places to sit and watch and be ready to react. Dow gaps up over the strong weekly resistance level 26069, gap fills and now price continues back to retest the recent high. 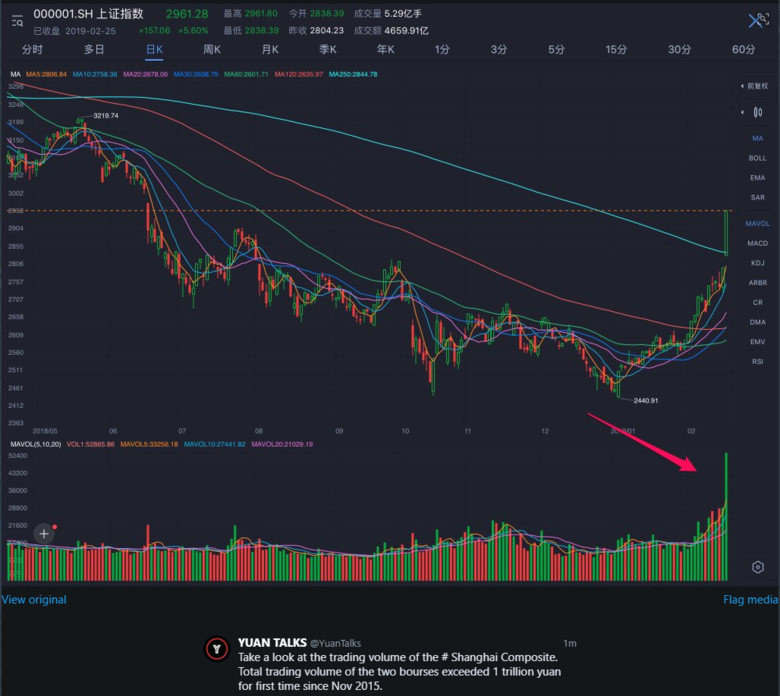 Shanghai composite up over 4% today with the improving outlook on a trade talks though we have been here before of course. 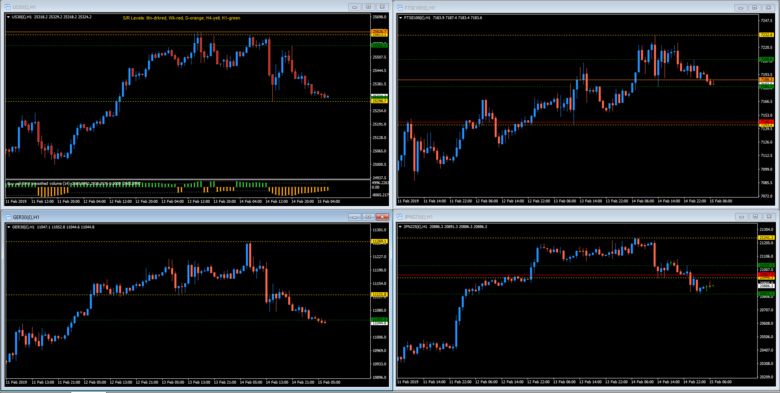 Looking for continuation today but keeping an eye on the news feed. 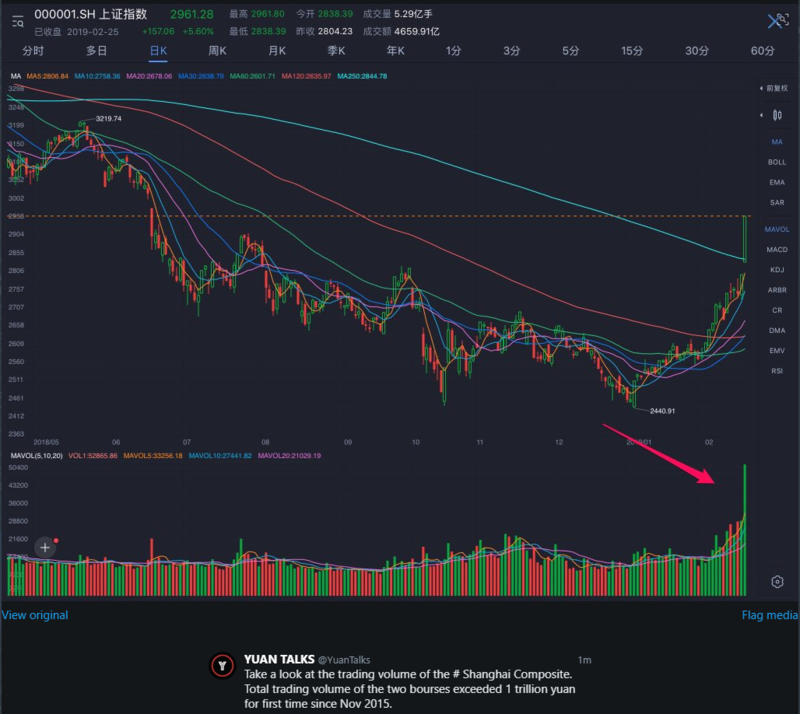 Shanghai composite gets massive boost in volume. Markets pullback on the realisation (once again) that there wasn't actually that much that come out of the trade talks other than a couple of Trump tweets. Still expecting slow continuation upward, now that the big resistance level has been broken and all the stops beyond taken out it's no longer the fixed boundary it was before. Interesting update to the ongoing trade talks from the South China Morning Post. Here is a great chart I originally posted on the forum back in 2016 and I'm very pleased to see it's recently been updated. It gives a valuable insight into the mind set of 'the punters' and has become famous over time as it is so revealing. Firstly it's important to point out these guys are not a bunch of amateurs, oh no, there are Nobel prize winners in here, great hedge fund managers, professional commentators all keen to leave their mark on posterity. So there are two themes going on, one is the actual chart itself, you will note it starts off in the bottom left hand corner and progresses diagonally up to the top right hand corner. 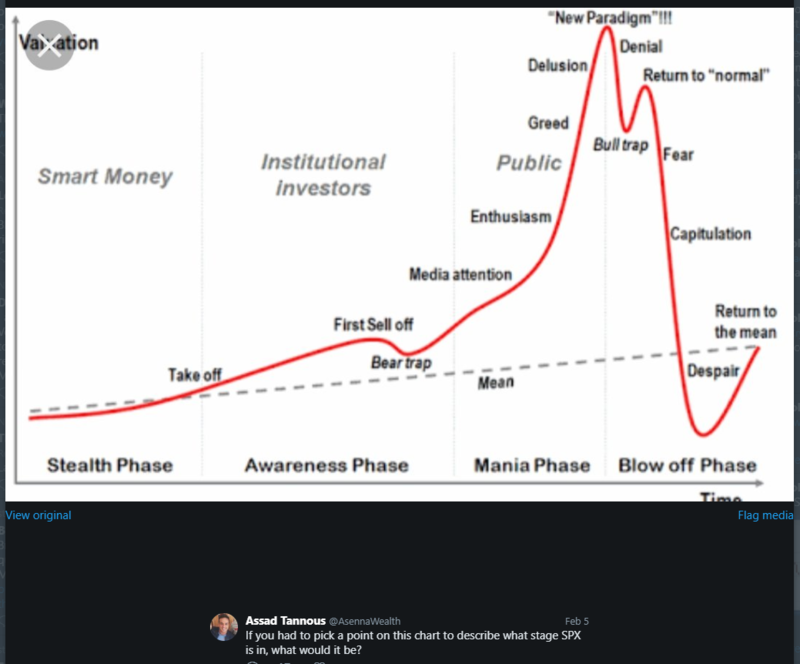 Like all charts that pictorial aspect alone speaks volumes, you only have to look at it and you can see exactly what's going on. Then the overlay is of all these great minds all trying to 'call the top', it's hilarious. How many goes are they going to have? As many as it takes it seems, one day maybe they will actually get it right it. But why are they even trying? When a chart rolls over it is obvious, it doesn't matter what the time frame, when you see it you can act, but constantly calling the top and so missing the repeated bull run continuations is not what the game is about. These guys have an agenda, trading successfully would not appear to be it. It is often said more money is lost trying to pick tops and bottoms than anything else, being constantly wrong footed by the market is disastrous. Getting in too late is more preferable to getting in too early. 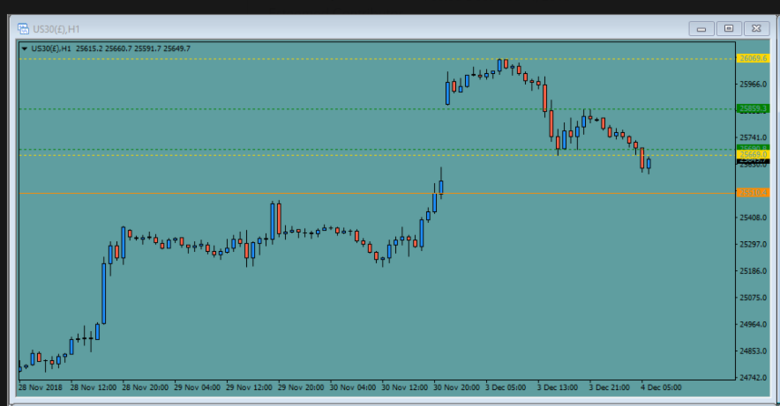 You don't need a bias, the chart is screaming out to you, the most likely next move is always going to be continuation. This is true of any asset on any time frame, when a major or even minor reversal does occur the candles will signal it and it will usually be at a significant level and usually with volume. 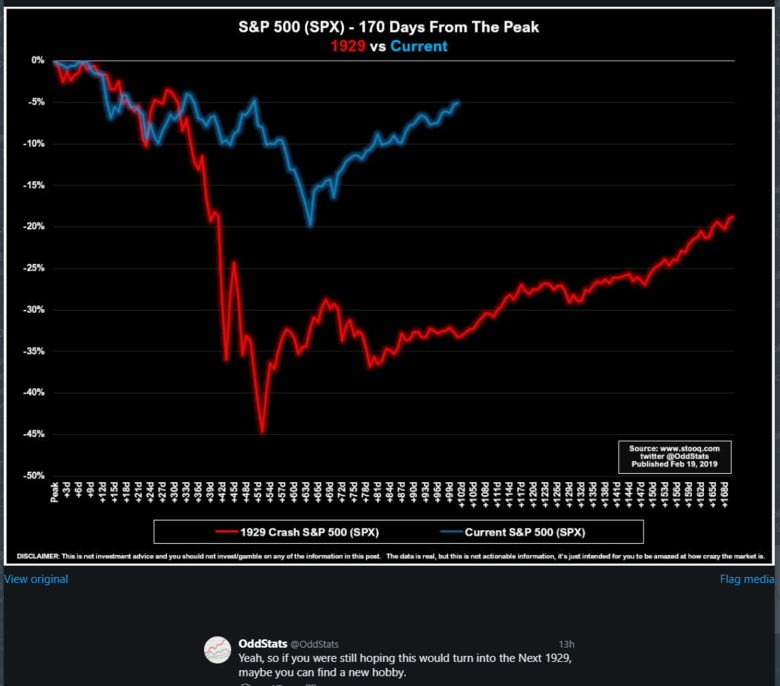 It is distracting and fruitless to be continually trying to second guess the market as these great minds have repeatedly proved over a very long period of time. Trump expects a deal to be signed today, the markets have learnt to be cautious, much of the good news has already been priced in over the last couple of weeks but always room for surprises. Ftse continues to be wildly erratic with Brexit uncertainty. To continue on the theme in the post above on why bias is bad and why trying to call tops and bottoms is pointless. Take a look at the daily chart of any asset you care to name. Look at random candles and note the colour of the following candle. The probability is that it will be the same colour. If you need a bias that's it, the next candle is most likely going to be a continuation candle. Take a look at the anatomy of a bull continuation candle. The candle opens at yesterday's close, buyers do not usually start buying straight away, they wait first to see if they can buy cheaper. 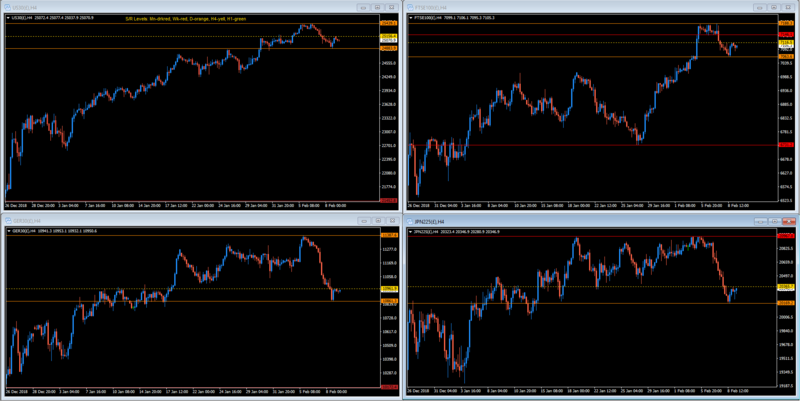 Bears and counter trenders will try their luck and oblige pushing price down. At some point the buyers will step back in and push price back up. A bottom tail is formed. As price goes back up through the open and the candle turns green is the first sign today will be a continuation day and you should be looking for longs. Price continuing on through yesterday's high is a second sign. Through the course of the day regular attempts at reversal turn into just pullbacks providing more opportunities to get long or for adding to longs. 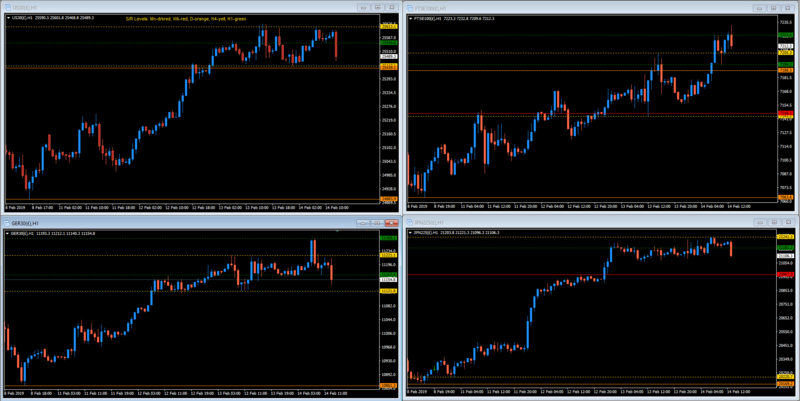 Near the end of the day the day traders are getting out and the top tail starts to form until the bar close. Though the 24 hour nature of many markets now skewers the picture somewhat the general pattern can still be seen. Major turning points in big markets often take days or even weeks and sometimes months to complete, take a step back and look at the weekly and monthly charts and the turning points become clear, there is no need to guess. 200 SMA on the weekly Dow. Trump Asia trip hits a couple of snags, no agreement yet on compliance verification with China and no agreement signing with North Korea. Dow going down to retest 25870 and possibly on to 25861, Nikkei, Dax and Ftse following suit. 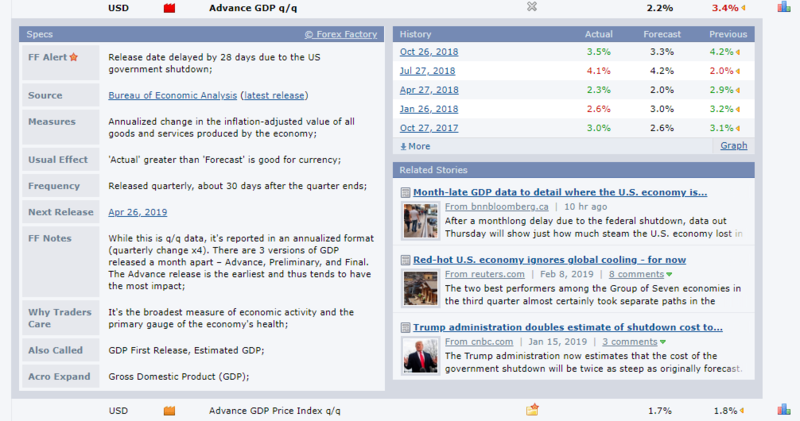 Delayed US GDP data (Govt shutdown) out today 1:30, may cause a splash.